Are you a bank, credit union or healthcare customer with a large deployment of scanners - ask us about our custom fulfillment programs for large customers with multiple locations! Remove dust, debris and oils that build up over time during the normal operation of your remote deposit check scanner. These exceptionally designed cleaning cards contain a unique cleaning solution that helps clean your scanner! Most manufacturers recommend that your scanner should be cleaned about once per month or every 3,000 checks (depending on your environment). These cleaning cards have been deployed to banks and credit union branches to individual businesses throughout the world. >Also works with Magtek, RDM and CTS models! Questions about the Check Scanner Cleaning Kit - Large? We can help. 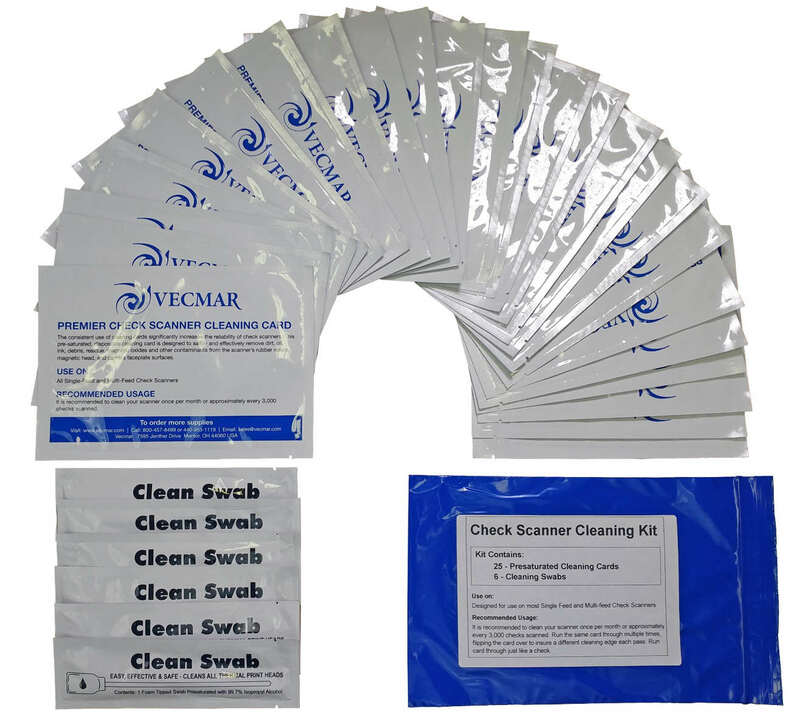 For more information about the Check Scanner Cleaning Kit - Large, or any of our products and services, call us at 1.800.457.8499 or email us. Order your Check Scanner Cleaning Kit - Large today. Order your Check Scanner Cleaning Kit - Large now. Your purchase order, with credit approval, is welcome, as well as all major credit cards, PayPal and Google Checkout. Remember, you'll get FREE technical service with every product you buy from Vecmar.